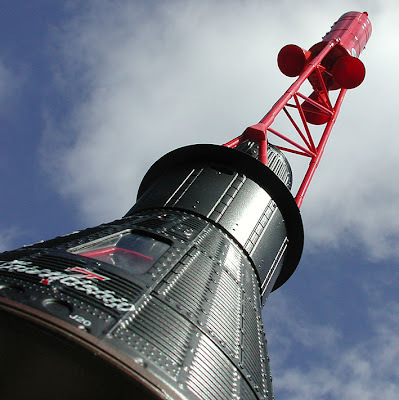 19 December 1960 saw the very first launch of a Mercury capsule on a Redstone booster. This short flight (15 minutes 45 seconds) did not carry an astronaut though, for it was a ‘boiler-plate’ capsule (see previous posting on this subject), a test article built to check out systems, from basics like “does it fit on the top of the launch rocket?” to later technicalities, such as checking parachute deployment. 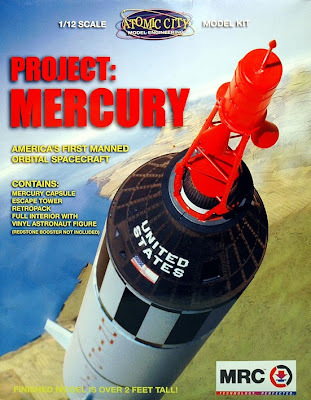 For many years the best Mercury capsule you could get as a model kit was a 1:48 scale version that arrived in a box along with its bigger two-man sibling, Gemini. This was by Revell, and the kit has been around for many years, also cropping up twice under the Monogram name. But a few years ago, space modelling enthusiast Scott Alexander made the brave decision to design and finance a larger (and ‘larger’ here means ‘a lot larger’) model of this iconic capsule to 1:12 scale, making it four times the size of the Revell kit, so it packs a whole lot of detail. Scott runs Atomic City Models, but he needed help with manufacture and distribution, so he involved the US company MRC, and the kit carries both names. It can be built as any one of the six capsules that carried astronauts, though the first MR-3 that launched Alan Shepard on his suborbital hop, was slightly different as far as windows and hatch are concerned, but the Atomic City plans include full details of the mods needed. The kit is mainly in styrene plastic moulded in several colours, though it does have a few parts in metal, and the astronaut figure comes in vinyl. The kit features as one of the detailed builds in my book Scale Spacecraft Modelling in which you will also find a great deal more, such as simple conversions, how to deal with resin kits, designing and building dioramas, and a complete scratch-build of a Mars module. 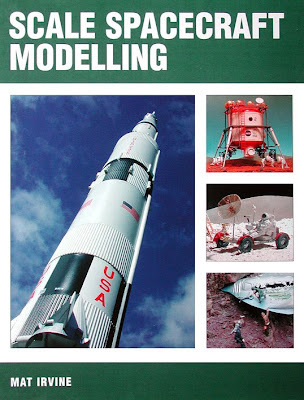 Scale Spacecraft Modelling is published by The Crowood Press, and is available from Amazon, along with various other books I’ve written here. Mat’s book is packed with fascinating material, so if you’re after a last-minute Christmas goody, we recommend it highly. 1 Atomic City/MRC Mercury kit box. 3 The model in Friendship 7 markings. 4 Mat’s SSM book jacket.